ADMATTER IS PROUD TO OFFER UP FOR SALE TODAY, THIS AWESOME ORIGINAL HARRY POTTER FILM CELL TRANSPARENCY!!! This is an EXTREMELY RARE and unusual item! 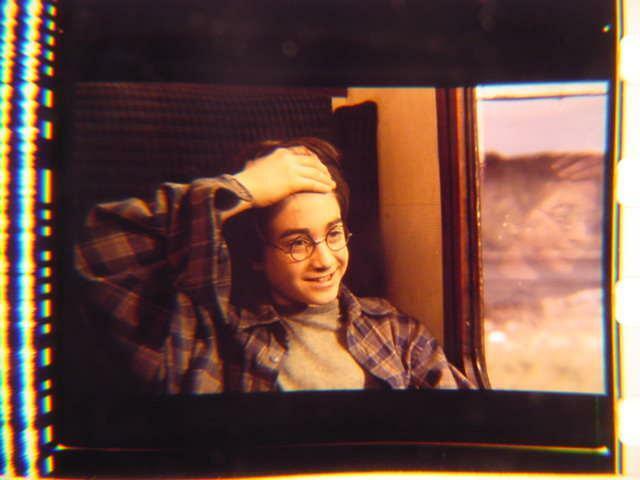 This is an ORIGINAL FILM TRANSPARENCY FROM A HARRY POTTER FILM! My picture does not do justice to this item This is an outstanding authentic piece of film memorabilia better than most on FeeBay! Please read my entire description BEFORE Bidding! That way neither of us will be disappointed! ***EVERYTHING ABOUT THIS ITEM IS AS ADVERTISED OR WE WILL GIVE YOUR MONEY BACK!! *** *** 100% SATISFACTION GUARANTEED!! *** ***BEING SOLD FROM ONE MOVIE COLLECTOR TO ANOTHER. NO COPYRIGHT IMPLIED, EXPRESSED, OR INTENDED*** ****These frames or film cells are from an original theater 35mm reel of film. A great addition to your movie memorabilia Collection! I have seen similar quality pieces go for 20 and up*** ***You can develop an INCREDIBLY SHARP photograph from this! (KINKOS does a wonderful job on enlargements! Much sharper than you would get from an original negative using a high-end retail camera. *** *** IMAGINE how sharp this image has be to get magnified so many times to be projected to a huge theater screen! *** ***This original footage comes protected behind 2 pieces of ANTI NEWTON GLASS in a mount measuring aprox. 2" X 2" This is a Top of the Line mount that I have seen sell for 7 each EMPTY! *** Sorry I know my picture is just plain terrible! I just could not even come close to capturing the amazing clarity of this. *** ***Shipping handling IN THE U.S.A. is 4.95 (International 3 extra)*** ***WE COMBINE SHIPPING! *** ***PLEASE ADD An additional 1.00 for EACH flat item won when auctions are combined! YOU MUST PAY FOR ALL YOUR ITEMS AT 1 TIME TO RECEIVE THIS DISCOUNT!! *** ***This item will be shipped FLAT sandwiched between cardboard "FOR ULTIMATE PROTECTION" We pride ourselves in packaging your investment properly! *** ***IF YOU WOULD LIKE YOUR item INSURED (U.S.A. ONLY) PLEASE ADD 2.00 To your total. INSURANCE IS OPTIONAL BUT comes HIGHLY RECOMMENDED, AS I CANNOT BE RESPONSIBLE FOR ANY ITEMS THAT ARE LOST OR DAMAGED IN POSTAL SYSTEM. *** ***I accept the following types of payment: *** ***CASH, CHECKS (TAKE 7-10 BUSINESS DAYS TO CLEAR) MONEY ORDERS AND PRAYPAL ERRR PAYPAL!!! *** THANKS!